Built for the Mackinac Transportation Co. for service beween St. Ignace & Mackinaw City, MI, the CHIEF WAWATAM was launched at the Toledo Shipbuilding Co. on August 26, 1911. Designed by Frank Kirby (who also designed Ann Arbor Nos. 1, 2, & 5) she was 338' in length and a beam of 62'. She was comparable in size to cross-lake ferries of her day, but differed in that she loaded through the bow, as opposed to the stern as the cross-lake ferries did. She had 1 bow propellor, used to break up the ice she encountered in the Straits, and 2 stern propellors, all powered by 3 triple-expansion engines rated at a total of 4500 hp. 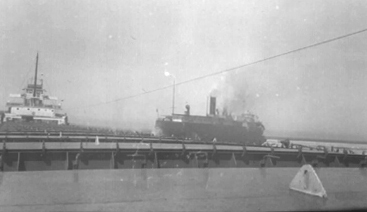 She arrived at St. Ignace on Oct. 18, 1911 and began service shortly thereafter. On her arrival, one of the two wooden carferries then in service, the SAINTE MARIE(I) was retired. Her engines were removed and placed in the new carferry, SAINTE MARIE(II), which was basically a shorter version of the CHIEF. 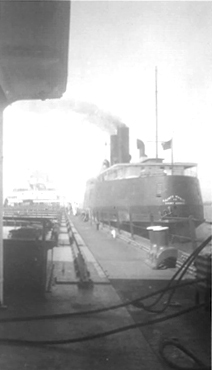 On her arrival in 1913, the wooden ST. IGNACE was retired. 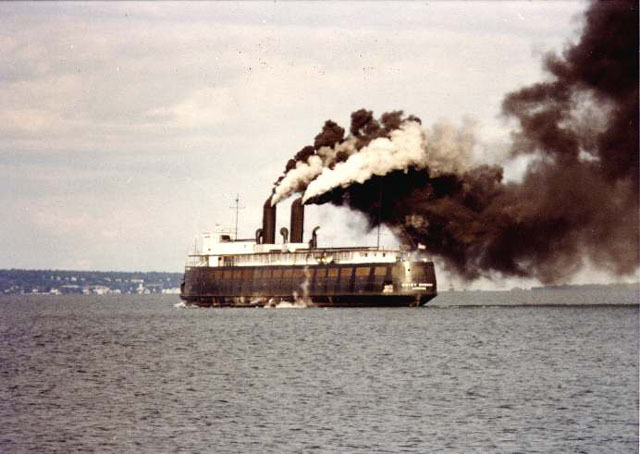 In contrast to the Lake Michigan carferries, the CHIEF's owners never actively pursued passenger service across the Straits: indeed, they discouraged it, although they did provide passenger service until 1958 and carried passenger cars for the Duluth, South Shore and Atlantic's "Lake Superior Limited" until August, 1955. In 1916, automobiles were handled and charged as 'freight'. They would have their gas tanks drained, be loaded onto freight cars and get charged $40 per vehicle. Although these rates were later lowered a good deal, high rates and the limited passenger space available led to the formation of the Michigan State Ferries in 1923. The CHIEF and the smaller SAINTE MARIE(II) did handle the less demanding passenger traffic in the winter months when the state ferries were laid up, and from 1936-1952 the state chartered the SAINTE MARIE (and on occasion, the CHIEF) for full passenger service during the winter. The cross-strait ferry service was never a big money maker, and saw a 50% drop in rail traffic from 1950-1960. 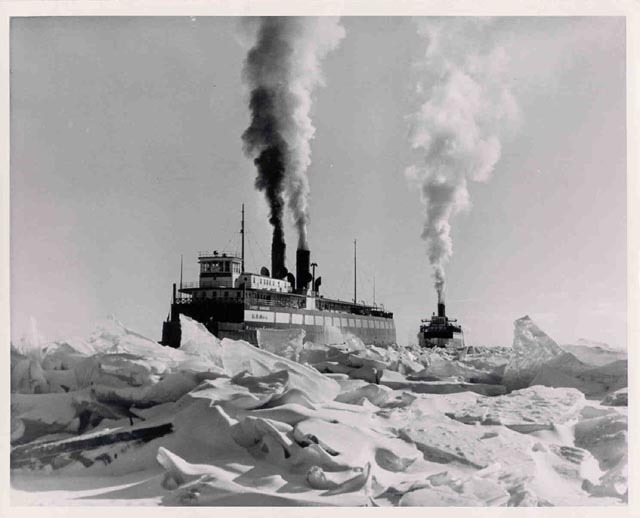 Both boats were often chartered for ice-breaking duty during the winter and spring, but with the arrival of the Coast Guard's MACKINAW in 1943, this source of revenue dried up, too. The SAINTE MARIE was laid up and sold for scrap in 1961. In 1964, the Mackinac Transportation Co. filed the first of what was to be many petitions with the ICC to abandon the service. It was refused. 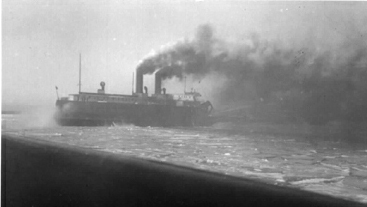 In 1965, the CHIEF's boilers had deteriorated to the point the tug JOHN PURVES was chartered to push the ferry back and forth aross the straits. Only enough steam pressure to operate the winches and sea gate was produced. In 1965, the CHIEF spent 6 months in drydock at Manitowoc WI for boiler repairs. During this time, ferry service was provided by the tug MUSKEGON and the barge MANISTEE, which was the cut-down hull of the ANN ARBOR #3. 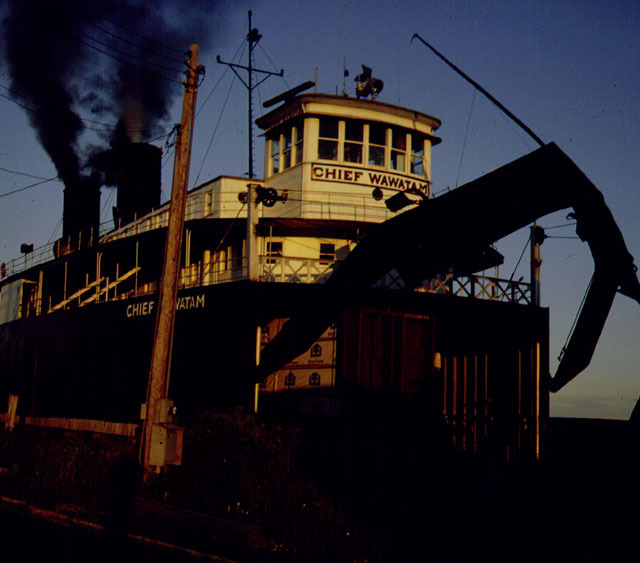 In April 1968, the CHIEF was 'retired' and laid up at Cheboygan, being replaced by the barge MANISTEE/MUSKEGON combo. However, the tug/barge unit could not cope with the ice of the following winter, and the CHIEF was called out of retirement in Jan. of 1969. The CHIEF had another brush with fate in 1971 when, while at Manitowoc for her 5-year inspection, she escaped the fire which destroyed the CITY OF SAGINAW 31. The 2 ferries had been berthed side-by-side, but the CHIEF was moved to anoter berth just 30 minutes prior to the outbreak of the fire. In 1976, the State of Michigan began subsidizing the service, and control of the ferry was shifted to the Straits Corporation. Service became sporadic, eventually dropping off to as little as 1 round-trip per week. In 1979, the State contracted with the Detroit & Mackinac RR to provide service to the ferry, and trips rose to 2 round-trips per day, 5 days per week. In July 1979, the Michigan Transportation Commission rejected a proposal to replace the CHIEF with an integrated tug/barge unit. Instead, money was funded to look into the possibility of converting the ship's boilers to oil. The CHIEF was not only one of the last coal-fired ships on the lakes, she also was the last 'hand-bomber' to sail. The conversion never took place. In August of 1984, the dock at St. Ignace collapsed and was not repaired, and the CHIEF had sailed for the last time. 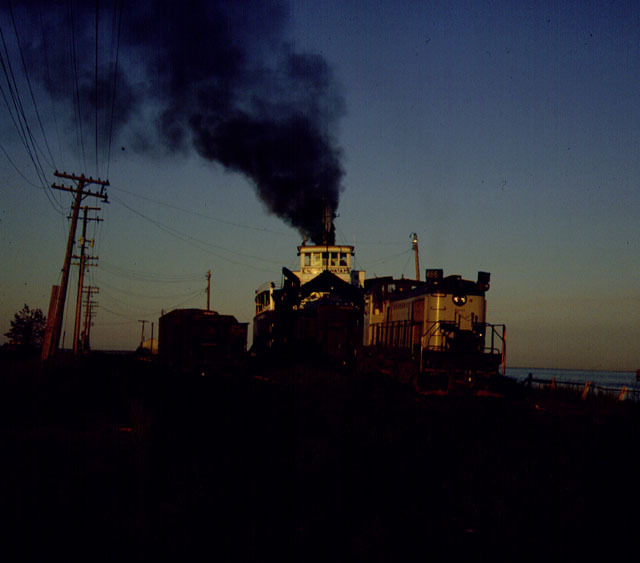 The death blow came in 1986 when the last rail link to St. Ignace was abandoned, thus negating any need for a ferry service. 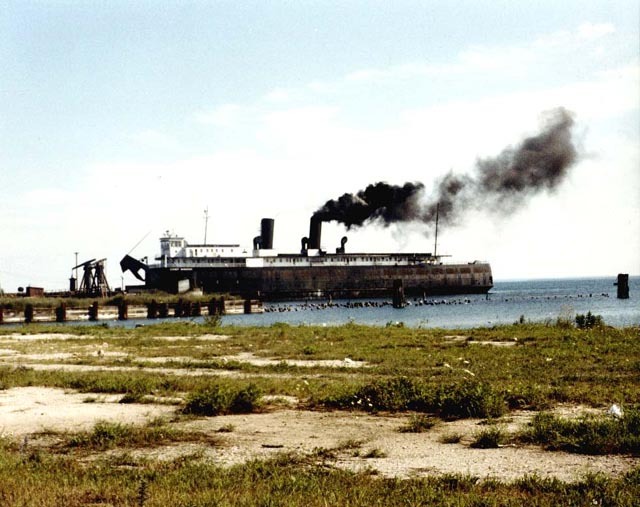 The CHIEF was laid-up at her dock in Mackinaw City until 1988, when, despite the best efforts of preservationists, the ferry was sold to Purvis Marine LTD of Sault Ste. Marie, ONT for $110,000 and was cut down to a deck barge. A few of her fittings were donated to area museums. She is still in barge service under her original name as of this writing. 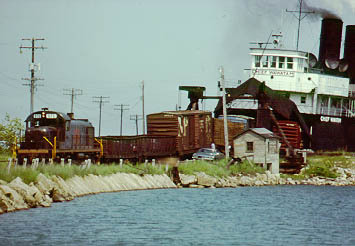 Detroit & Mackinac number 975 unloads the car ferry Chief Wawatam in July 1979, by Tim and Sherrie Vermandie. With her seagate open. Bob Wilson. Video of the Chief, along with audio of her whistle. Courtesy of Mark Howell, producer of the award winning videos "Before the Bridge", Building the Mighty Mac", and "The Milwaukee Clipper". Real Audio is required to play, If you do not have the Real Audio player, please click here to down load. Copyright © 1999 - 2000 Bob Strauss execpt where indicated.